Home / Blog/Training Tips / Let’s Play Fetch and Tug! Let’s Play Fetch and Tug! Have a specific toy you use for tug. Keep it out of his reach unless you are engaged in the game. This makes the object more desirable (it’s not always just hanging around) and it is connected with the game of tug. This way, your dog will associate this item with the game and will not pick up random toys/items and try to get you to tug. To avoid any accidental mouth on arm, your tug toy should be long (2’-4’), at least as long as your dog’s body length. The bigger the dog, the longer the tug. I make my own tugs by braiding old t-shirt or fleece strips. You can also use a Flirt Pole to play tug/chase with your dog. Make sure your dog knows how to “drop” before engaging in tug (see Fetch below!). Practice exchanging items with your dog. Start by always offering your dog something with a higher value than what is in his mouth so that he wants to drop things for you. Cue DROP. If you need to wave a high value treat under his nose or dropped on the floor to get him to drop the tug that is OK. If mouth touches skin, game over. Simply (and calmly) put the toy away and stop playing. You can start again in a few minutes. One game of TUG teaches your dog FIVE cues (sit, wait, leave it, take and drop) and a whole lot of impulse control! Fetch is an excellent way to teach your dog the DROP cue. And, if you are feeling a bit lazy, it is also a great way to get him some exercise without you having to move (much). Some dogs are not natural fetchers but it can be taught. Release with “OK” and toss ball/toy. If your dog does not seem like a natural fetcher, only throw the ball a short distance from you (maybe 2-4 feet). 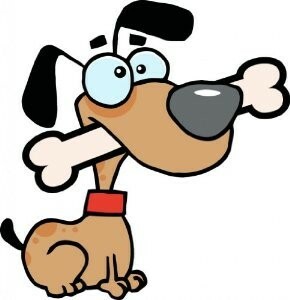 Once the dog retrieves ball, entice her back to you – show her the treat, call her name, get excited! Just do not say “come” because if she chooses to ignore you, you have just taught her that cue is optional so say anything else – her name, “over here” etc. Once she is in your vicinity say DROP and then hold out a treat (directly under her nose if needed!) or toss a few on the floor next to her and exchange it for the ball. 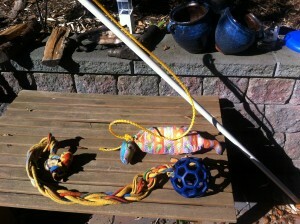 You can also use another toy (squeaky usually works) to exchange if a toy is more reinforcing than food is to your dog. If she is not coming close to you try running AWAY from her with a happy voice to get her to chase you. If you are using a clicker, click as soon as the ball is released and give treat. NOTE: If your dog seems to lose interest after a few throws try doing fewer repetitions in a session. So, if your dog seems to poop out after 6 repetitions, stop playing at 4 so that you keep your dog’s interest in the game. For more ideas for fun and games check out our Pinterest Page on Games & Enrichment. Homemade Flirt Pole and Tug Toy. No big bucks spent here folks!